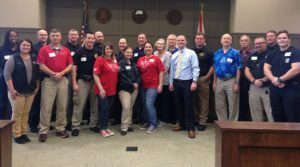 First responders in Shelby County and surrounding areas attended a training session on handling situations involving civilians on the autism spectrum at Alabaster City Hall on Friday, Jan. 20 from 9 a.m. to 2 p.m. The session was lead by Interaction Advisory Group president and cofounder Dustin Chandler. “We are training first responders on how to have safer and better interactions with people on the autism spectrum and people with developmental disabilities,” Chandler said. During the session, first responders learned about what autism is, how to recognize signs of autism and how to properly communicate with those affected by autism. According to the Center for Disease Control and Prevention, autism is a neurodevelopmental disorder. 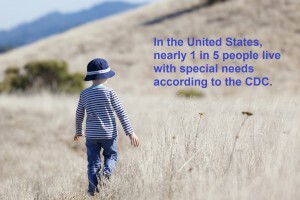 One in 68 children in the United States are affected by autism. Chandler said no two cases of autism are alike, and autism affects people in varying degrees. Chandler said those who attended the training session would have a better understanding of how to identify and communicate with civilians affected by autism and avoid misunderstandings. “This is to keep everybody safe, and teach them about how to recognize certain behaviors and communicate with people who are on the spectrum,” Chandler said. Chandler said the session also served to raise awareness about autism in the community. “We’ve had people in Alabama, who are in law enforcement, who have never even heard of autism, not necessarily here,” Chandler said. The session was sponsored by the Autism Society of Alabama and organized by the Angel Warriors Foundation, an Alabaster-based nonprofit organization. A man had stopped his car on 31 North near Highway 119, stopped in the middle of an intersection, gotten out of his car and stood there—urinating, on himself. A policeman’s first instinct, naturally, would be to suspect DUI. The man had to be under the influence of something; why, otherwise, would he stand in the middle of the street in the middle of the night wetting himself? But Chandler suspected otherwise. So, after conveying to his fellow officer that something else might be afoot, he began talking to the man. Soon, he recognized him from the community, recognized him as someone with a developmental disability, whose symptoms may mimic those of a person who is either drunk or on drugs. In fact, it was later learned, the man suffered from autism—or more correctly, Spectrum Disorder, the neurodevelopmental affliction that variously impairs the sufferer’s ability to effectively communicate or interact with others. Some sufferers are highly functional (and are able to drive and live independently); others are not. Chandler recognized the symptoms not because he was trained to do so, but because, as many Alabamians know, his young daughter suffers from CDLK5, a rare genetic disorder with no known cure; she later became the namesake for Alabama’s Carly’s Law. Passed in 2014, it creates an affirmative defense for patients suffering from debilitating epileptic conditions—and their caregivers—for using marijuana extracts for treatment. Chandler’s ability to see that there may have been another explanation for such odd behavior—behavior that would have had us undergoing sobriety tests, trying to touch our nose and stuff—prevented the man from becoming yet another person suffering from a disorder to be engulfed in our criminal justice system, which, as recent coverage AL.com revealed, is overburdened and ill-equipped to handle prisoners suffering with mental health issues or other disorders. “I’m not sure what would have happened had I not been there,” says Chandler. In January 2015 Chandler resigned from the department following the release of an audio tape revealing some fellow officers mocking special needs children. Near the end of the year, he launched the Interaction Advisory Group, to help train police officers on how to better engage with people with autism and other developmental disabilities during on-duty interactions or encounters. IAG—a partnership between Chandler, the Kirchner Group and the UAB School of Health Professions—has conducted training sessions, funded by the Autism Society of Alabama, with departments across the state. Chandler has also had training requests from agencies as far away as Southern California. This week, Chandler is in Washington, D.C. speaking with national leaders and their staffs about the importance of autism training. Next month, Chandler will attend a law enforcement summit in Montgomery, hosted by state attorney general Luther Strange, and speak about autism training before an audience of about 500 officers. When he started IAG, Chandler had no idea that less than a year later, his services would be in such high demand. He also didn’t know the interaction between police offers and some Americans—read: black men, in particular—would become perhaps the most volatile topic of conversation, media coverage and social-media chatter in the nation. I first met Chandler in mid-July during an appearance on the Matt Murphy Show to discuss my column on the police shooting of Alton Sterling in Baton Rouge, which had been followed the next day by a column on Sterling and Philando Castille, who was killed by a policeman in Falcon Heights, Minnesota, while sitting in his car with his girlfriend and her young son. The show occurred a few days later, on the morning after the killing of five Dallas police officers by a lone gunman. It had been a week that touched us all—like pouring iodine into a long-open wound that still has nowhere near healed. The show was tense, as expected, but the ex-cop to my right was reasonable and insightful, not a knee-jerk defender of all things blue. Afterwards we chatted for a bit and I learned of his mission to train officers on how to better handle encounters with people with disabling disorders, such as autism. “I go back to my own police training,” he said. “Police are trained to keep themselves safe, which I understand. But certain situations don’t always call for use of deadly force, which it’s sometimes hard to tell in a split second. For various reasons, someone with a developmental disability is seven times more likely to have an encounter with the police, according to an FBI study. And there’ve been numerous incidents in recent months between police around the nation and someone with a developmental disability. One of the most visible happened on July 18 in North Miami, Florida, when Charles Kinsey, a behavioral specialist (who is African-American) was shot by a policeman as he lay on the ground with his hands up next to his patient, who had walked out of the MacTown Panther Group Homes a few block away. The officer shot Kinsey, and later stated, through a police union official, that he did so accidently; he meant to shoot the patient because he thought he was going to harm Kinsey with the object in his hand. It was a toy truck. Chandler watched the widely circulated video of the incident: “I can’t say what the officer saw was a gun or not but the caregiver was trying to say the guy had autism. We just have to start thinking about a better way to handle. There were certain cues, I saw from watching just a few seconds of video. If we see certain behavior in an individual, we need to not be so quick to make certain decisions. Chandler always reiterates that he’s not anti-cop, and he’s not, by any stretch. With IAG he has found audiences that are open and willing to learn. “We do not train that police officers should not arrest a person with autism,” he says. “But if they have to go to jail there are certain things officers must know to make sure the subject is safe and treated fairly to improve their due process: do they truly understand the Miranda warning; are you checking off everything that should be checked off? In October, IAG hopes to rollout an on-line version of its training program that will allow departments to use it without Chandler being present. When he is engaged, however, Chandler is beginning to incorporate autism sufferers and caregivers into his training. I asked him, recently, if he believes his training could be expanded, to help officers to consider de-escalation in all high-stress, split-second encounters, beyond simply those with persons with a developmental disability. But perhaps easier, if it is discussed and trained and ingrained sooner, rather than too late. OPELIKA, Ala.- Dustin Chandler served a decade as a narcotics officer. He also has a daughter with special needs. Chandler is the President and Co-Founder of Interaction Advisory Group, a group dedicated to the interactions and dynamics of those with special needs. Chandler said his experience wearing the badge and as a parent served as a calling for him. Friday morning, Chandler led close to 80 first responders around the Chattahoochee Valley in Autism training. Chandler taught attendees what to expect when encountering someone with Autism, how to manage the situation, how to communicate with them and more. Luanne Helms is the organizer of the event. This is the second year she has done the event, and she said it is the largest training of this type in the state. Her son, Jake has non-verbal Autism. Helms said Jake is the catalyst for the training. “It makes me feel safe for Jake to be able to go out and enjoy his community and be a part of the community, work in the community, he volunteers in the community, so it brings up a level of safety for everybody across the board,” Helms said. Captain Shane Healey of the Opelika Police Department said the training gives a whole new perspective to those who may not know how to handle a situation. Helms said she is hoping to do another training session in the early part of 2017. HOOVER, Ala. (WIAT) — The man best known for his role in helping pass Carly’s Law, named for his daughter, is taking on a different mission. Former Pelham Police Officer Dustin Chandler is launching a company to train officers how to interact with people with special needs. Chandler helped persuade state legislators to legalize the controlled medical use of the marijuana derivative CBD oil to help patients like his daughter. He says he and his business partners with the Kirchner Group launched Interaction Advisory Group on November 18th because understanding how to interact with people with special needs is a safety issue for any first responder. It’s also a safety issue for people who have special needs, according to Chandler. “Really in the back of my mind is I have a foot in both camps. I was police officer for a long time. I’ve been on several different scary situations with individuals, not just with disabilities or anything, but in general. So I know what the guys on the street and the women on the street in law enforcement are going through. So I give a unique perspective, but always in the back of my mind is obviously people that I know and certain situations that I know could occur with the families that I know and even with the ones that I don’t know,” said Chandler. According to Chandler, IAG training includes real world scenarios and demonstrations to help first responders prepare for a crisis situation involving a person with special needs. “Being in the background that I’ve got and being a law enforcement officer there is definitely a need for training on how to understand especially a person with autism. Not every two cases of a person with autism are going to be the same. They’re going to be different and there are certain things that they need to know about a person with autism or what might occur with autism if they come in contact with that and there’s just a gap in training for that. That leads to being unsafe for officers and absolutely unsafe for citizens and we want to keep both of them safe,”said Chandler. Chandler says he’s always trying to advocate for his daughter and for the special needs community and disability community to try to bridge the gap between the general public and that population. He is also trying to build awareness and respect for the difficulties facing those communities. The former Pelham Police Officer turned advocate says several situations have struck a chord with him, but there’s no single instance prompted him to look towards training officers full time. “No I think there’s several examples that we see in society that point to the need for this training. There wasn’t really one instance that’s pointed towards the training. I was drawn into this training because of the need that I see of the lack of training when I was a police officer, but there’s several instances across America that we see might’ve been, could’ve been handled differently and here locally there’s been stories put out and we just want to address some of these issue in the training gap,” said Chandler.